Bandichhor Kabir Sahib is the Complete God (Purna Parmatma). He is the ordainer of infinite crore brahmands. Once, on hearing the true spiritual instructions of Kabir Sahib, Hindus and Muslims became displeased with Him and gathering in large numbers came to Sikander Lodhi, the Emperor of Delhi (who had gone to Kaashi). They made a false complaint against Kabir Sahib. The Muslims said that this Kabir is spoiling the image of our religion. He says that Khuda (God) is not in Mosque. I only am God. Those who eat meat are sinful people. God will punish them and they will go to hell. Oh Kabir Sahib! 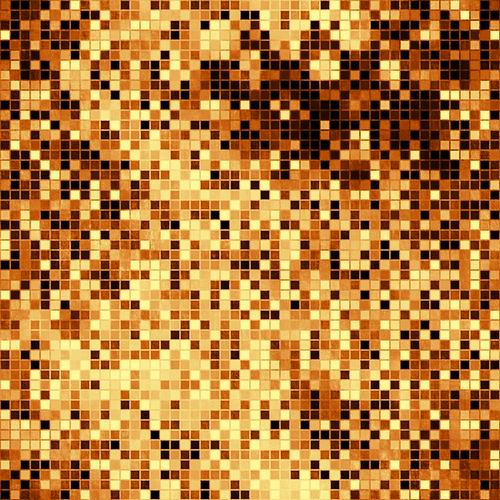 You are God in reality. Please forgive me. The Emperor of Delhi, Sikander Lodhi, sent Sahib Kabir home in a litter (a conveyance consisting of a chair or bed carried on two poles by bearers). A corpse of a boy (approximately 12 years of age) was coming flowing in water. Sikander Lodhi’s spiritual guru (Peer) Shekhtaki said that I will accept Kabir Sahib as God only if he restores this corpse to life before me. Sahib thought that if this Shekhtaki will accept my word and will recognise the PUrna Parmatma, then he may direct all the Muslims to the true path and they may become liberated from Kaal’s trap. King Sikander Lodhi and hundreds of soldiers were present on the bank of that river. At that time, Sahib Kabir said that Shekh Ji – you may try first, otherwise, will later say that even I could do this. On this Shekhtaki said that this Kabir thinks that after sometime this corpse will flow further away and the trouble will be averted. At that very moment, Sahib Kabir said, “Oh soul! 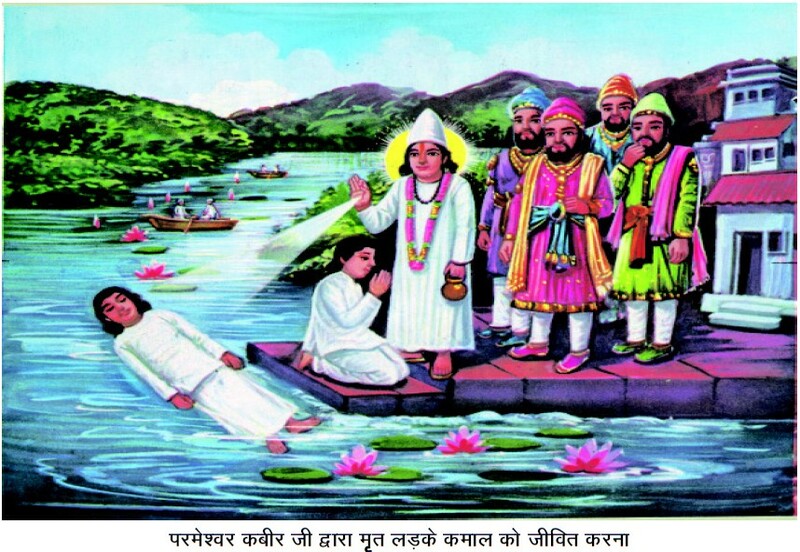 Wherever you are, by Kabir’s order enter into this corpse and come out.” Immediately that twelve years old boy became alive and came out and prostrated in Sahib’s feet. All the people present there said, “Sahib has done a miracle (Kamaal).” That boy was named ‘Kamaal’ and Sahib kept him with him as his son. The news of this incident spread to far-off places. Kabir Sahib became very popular. Lakhs of wise devout souls started getting their welfare done by seeking refuge in one God (Sahib Kabir). But Shekhtaki felt insulted and became jealous of Sahib Kabir. One day, Shekhtaki on finding an opportunity misled large numbers of Muslims and took them to Sikander Lodhi. At that time, Sahib Kabir on special request of Sikander Lodhi was staying at his place in Delhi. When Sikander Lodhi asked the reason for the arrival of so many people, he was told that Shekhtaki is saying that this Kabir is Kafir (disbeliever). He has some magical skills. If this Kabir will bring my daughter, who has died and has been buried in grave for nearly fifteen days, back to life then I as well as all the men present here will take his refuge; otherwise, this kafir will be punished. Sahib Kabir thought that this ignorant soul might gain salvation himself and might also bring about the welfare of other souls. Because all these living beings whether today they are Muslim or Hindu, Sikh or Christian, they all are part of Kabir Sahib (Purna Parmatma) only. Kaal God has misled them. 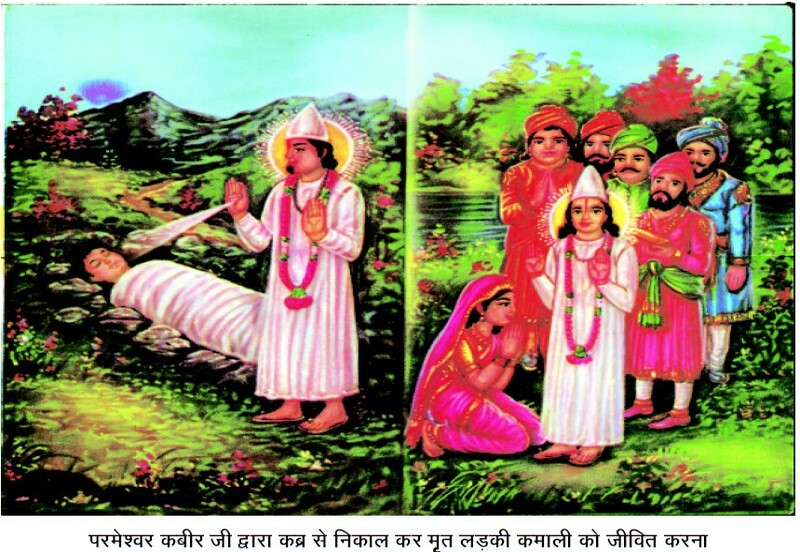 Kabir Sahib said, “On the third day from today, your daughter buried in the grave will be restored to life.” Thousands of spectators gathered around the grave at the scheduled time. Kabir saih said, “Oh Shekhtaki! You may also try.” The men present there said that if Shekhtaki had any power, then who would let his daughter die? You may kindly do the favour.” Then Kabir Sahib disentombed the grave and brought that many days old dead body back to life. It was a dead body of a nearly 13 years old girl. All the people present there said that Kabir Sahib has done a miracle; He has done a miracle! Kabir Sahib named that girl Kamaali. The girl refused to go with his father Shekhtaki and said, “Oh ignorant being! This is the Supreme God (SatPurush) Himself. Fall at His feet for your welfare. He is a kind God.” Thousands of persons by becoming (mad'bhakt) Matavlambi bhakt i.e. according to Sahib Kabir’s viewpoint got their welfare done i.e. took naam-daan and Sahib Kabir kept that girl Kamaali with him as his daughter.